Bionomic Industries, Inc., an industry leading manufacturer of proven air pollution abatement, product and heat recovery technologies, has announced release of their new ScrubPac Custom Skid-Mounted Scrubber System. ScrubPac is the only available cost effective, "packaged" system engineered to meet the exact demands of a customer's process emission control application. All necessary components-recirculation pumps, piping and valve networks, exchangers, instrumentation, controls, and any other essential items needed to satisfy customer application requirements are included in the system. 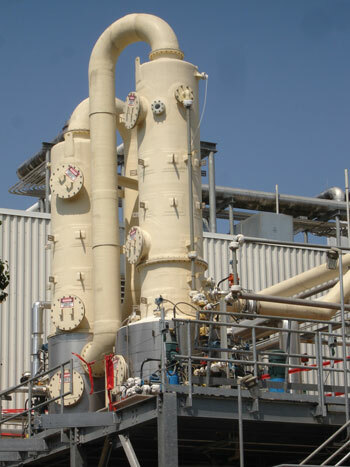 Systems are available for batch or continuous operation, semi or fully automatic operation, along with pretreatment options (high temperature gas quenchers, VOC condensers, super saturators for fine particulate capture), standard or customer specified instruments, controls and mechanical components, local or remote system control/monitoring, and special spill containment skids and modularized, skid-mounted assemblies for large system hard to fit spaces. Factory assembled, run tested and operational when they arrive on site, the systems require only process and utility connections and are available for gas capacities from 100 through 150,000 acfm. Typical applications include VOC scrubbing, nitrogen oxide, hydrogen sulfide and organo-sulfur compound removal, acid and ammonia scrubbing, halogens and amines removal, aerosol removal, fume and gas scrubbing, and mist removal.